, setting its own minimum at $20. for the National Federation of Independent Business, the nation’s largest advocacy group for small companies. , big businesses still achieve economies of scale through centralized HR and benefits departments. They also have the upfront capital needed to invest in automation, such as the purchasing kiosks now in place at McDonalds, that will make businesses less subject to labor costs in the future. released in 2018 found that fast food restaurants were more likely to go out of business following a minimum wage hike — and new ones were more likely to start up, creating a negligible long-term change in employment but difficult experiences for many individual business owners. enough across the US economy to sustain those cost increases without eating into profits. That said, a higher minimum wage could start to compress margins this year, Oxford Economics analyst Lydia Boussour predicts. For large companies, opposing a hike comes along with bad publicity, which lately just doesn’t seem to be worth it for corporate America — especially for those with a consumer-facing brand reputation to maintain. And if a big business has to pay higher wages, it helps them if smaller competitors are forced to do the same. “You level the playing field,” King said. of applicants for its jobs. Recent editions of the Federal Reserve’s Beige Book, an anecdotal economic survey published every few months, have contained several references to other businesses having trouble recruiting in the face of well-publicized wage hikes by large employers. Amazon has also made its presence felt on Capitol Hill, holding meetings with lawmakers in support of the Raise the Wage Act. It’s perhaps a prudent choice, since for the biggest and most profitable businesses, it’s becoming clear that $15 isn’t enough. the finances of a hypothetical single mother making $16.50 an hour at one of his Chase branches in California. Every month, the worker would end up in the red, even as the bank recorded a profit of $9.18 billion for the quarter. “She’s short $567, what would you suggest she do?” asked Porter, a Democrat. “I don’t know, I’d have to think about that,” Dimon replied. last fall in order to negotiate over issues like menu pricing with corporate headquarters. opposed to the $15 minimum wage bill. Another, the US Chamber of Commerce, declined to comment on the issue. Republican appointees that would mostly close off that possibility. 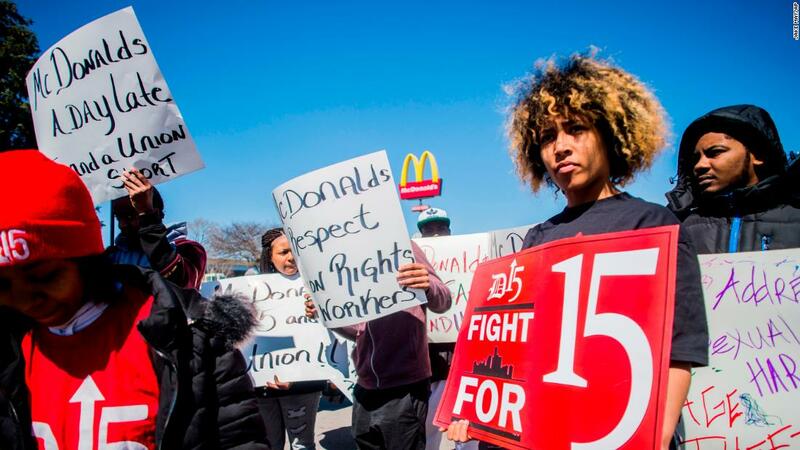 As local minimum wage legislation has cropped up around the country, franchisees have demanded that they be treated like small businesses, rather than large businesses that are sometimes required to raise their wages on an accelerated timeline. They’re now pushing Congress to pre-empt such differential treatment in the future. , employers already have to pay that now — places like Tuscaloosa, Alabama wouldn’t get there until 2033.
, the idea that they’re bad for business is hard to shake.